Population: About 1500 Ecuadorians, all around the village of Villamil. Landscape: Dry, high, and volcanic. History: The first humans on Isabela were the pirates who arrived in the 17th century. Later, Norwegian whalers processed whale meat here. Agricultural exploitation of the island started when the Ecuadorian government took over in 1832. Under the direction of Jose Villamil, land was distributed to agricultural workers who, in exchange for cultivating this volcanic land, were given title to to the land. A second penal colony was established in 1945, located 6 km from the town of Villamil. The Park Monument "Wall of Tears" is a testament to the horrors of that penal colony which was converted to an agricultural penal colony in 1959. The current economic activities of the Isabela residents are fishing and tourism. We saw another form of economic exploitation when Japanese businessmen arrived to buy the illegally harvested sea cucumbers at several dollars per dried animal. 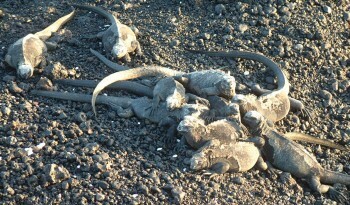 You can also read our Galapagos Cruising Information Newsletter that we emailed from the boat while we were there. And on Sue's pages, there is more on the Flora and Fauna and Birds of the Galapagos. (Amanda age 14) We had planned for Isabela just to be a quick stop, and then a jump-off for the Marquesas, but it turned out we spent basically a week there. There were a fair number of boats there, and a lot of them had kids, some that we had never met before. It was fun to hang out with them, going swimming or to go look at the shark grotto. The shark grotto was located along a short walk around a small island, and most of the day you could see about a dozen white-tip sharks in there, all swimming in circles or sitting on one another. Apparently they don't have to swim to breathe. 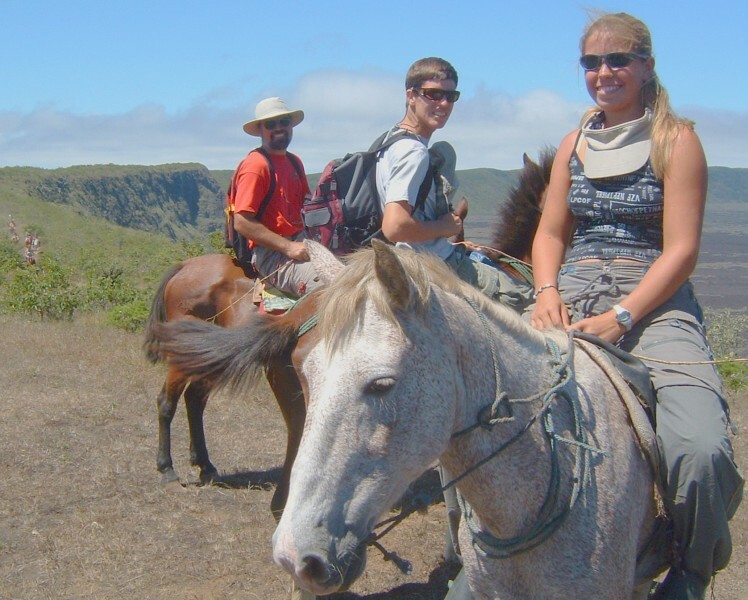 One thing that nearly everyone who goes to Isabela does is a horseback ride, up to the second biggest caldera in the world. It was a bit expensive to go with the English-speaking guide that most people used, so we got together a bunch of people and went with the horse-owner himself, who dropped the price almost by half. The ride was wonderful! It started out on a dirt road, and then went to a small path through bushes and grass. Once we got up to the caldera, the trail opened up and we could go faster than a walk or trot. It was fun to gallop around the edge, it was my first time galloping, but that meant we couldn't really look around. We stopped at several viewpoints, and it was stunning, even just the size of it. It was huge! (Chris ae 16) With the possible exception of our tour, Isabela island was undoubtedly the best part of the Galapagos. 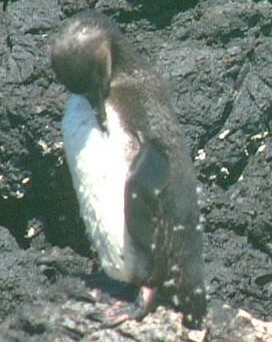 On our very first day, we went to a small island just off Isabela's coast where we saw a cut in the rocks that was full of sharks, a beach with a large sea lion colony, another beach with some rather large marine iguanas, sometimes literally piled on top of one another, and a penguin rookery. Several other kinds of birds inhabited the area, and there were always sea lions swimming and playing in the clear water. On shore, Villamil was a comfortable little town with sandy streets and small white houses very similar to elsewhere in the Galapagos. There was a small open-air restaurant where we had a nice meal one evening, and places to buy diesel. The island of Isabela was quite beautifully lush. The largest of the Galapagos, Isabela is a relatively young island composed of three volcanoes whose lava flows have merged. Isabela has the highest peak in the Galapagos, and parts of the island's volcanic slopes are very thick with verdant forest. 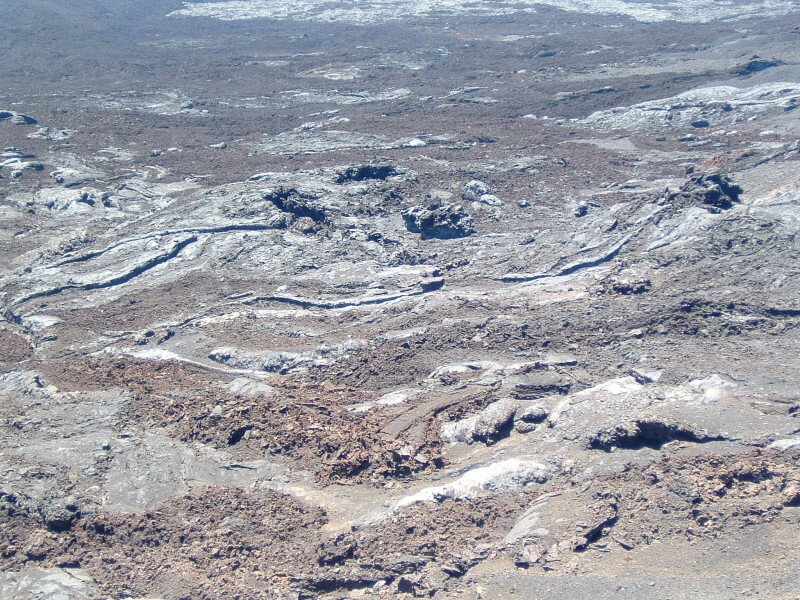 Other parts of the island are covered by lava flows. Nothing grows in these places, but is is possible to see the lines where a more recent flow hit hard volcanic rock from an older one. Walking over the flows, we could see rippling rivers, hollow tubes, and many other formations. you can't really see the other side! Another joy of being in Isabela was being with all the other cruising kids. There were more than 10 kids there most of the time we were in the anchorage, many of them teens. We all had fun swimming, exploring, and socializing (it is rare to find many kids in one place, so we tend to make the best of any opportunities). The best thing we did in Isabela, however, was the horseback ride. We had heard about the ride from other people, and hoped to go since long before reaching the Galapagos. 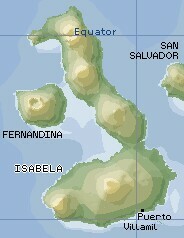 When we arrived in Isabela, we learned that the ride started with a drive up a volcano. 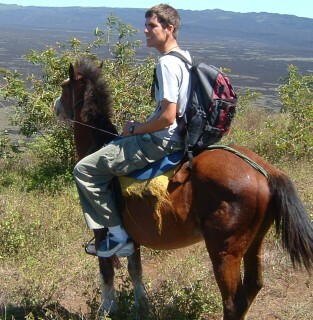 We then mount up for the ride up to the caldera. We have lunch at the turn around point, and there is also a foot path out on the lava flows. We arranged to go up with a group of other cruisers, including 6 other kids. The drive up the mountain took us through scruffy growth in old lava flows, lush, moist jungle, and several other layers of vegetation. At the trailhead, we got out of our vehicle (an open pickup) and mounted our horses. Once we were all organized, we started out up the trail. Riding a horse is wonderfully fun (and a special treat for me, as I have been on very few rides) but it is especially great as a way to explore. A horse gives you a higher vantage point, and on a smooth path, a rider can look around without needing to watch the path. Best of all, riding a running horse is an absolutely wonderful feeling. The first part of the path was narrow and overgrown, not the best for a gallop. However, as we reached the caldera, the trail widened into a broad, level path along the crater's rim. My horse was eager to run (I found out later my mom had specifically requested a fast one for me) and conditions for it couldn't have been better. I had never ridden faster than a canter before (and that only once,) but the caldera rim was just perfect. The only problem was that the view was so wonderful that it would have been a real shame to miss it, so every few minutes I would rein in to give us both a breather and let me look around while the others caught up. We followed the rim a considerable distance, then peeled off towards an immense tree. We tied the horses where they could graze, then had a snack ourselves. 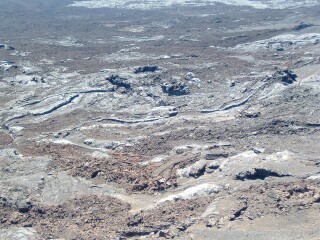 After the snack, we walked out onto the lava field. It was beautiful, in a sterile sort of way, but very hot out on the red-gray rock. We returned to the shade of the tree for lunch, then we kids climbed the trees for a bit before we all remounted for our ride back. After another fast ride and another view of the immense, awesome caldera, we returned our horses and got back in the pickup. The rim of the 2nd largest caldera in the world! (Jon) I, too, enjoyed Isabela a lot. The anchorage was much more protected than any of the other islands, there were lots of animals to be seen close by, we found nice (if cold) snorkeling, and the village had a comfortable relaxed atmosphere. There were several other kid-boats, and everyone was preparing for the 20-30 day passage to the Marquesas. The shark grotto was an unexpected treat. A trail out on one of the islands that protected our anchorage led past a cut in the lava. This cut was only 10-15' wide but perhaps 100' long. For some reason, the local sharks just loved this cut. They would swim lazily in circles or even sleep there. (Most sharks need to keep moving to keep water moving through their gills, but a very few species can sleep and still pump water past their gills, like fish). The funniest part was just at the end of the cut, where someone had stuck a "No Swimming" sign! (Sue) After almost 3 weeks in the Galapagos, Isabela was still a delight, and offered different scenery (though no new animals) from the other islands. For cruisers with limited time, I think this would be my first recommendation. The town of Villamil is small, friendly, and very informal. Tiny shops line the sandy streets, the officials are mellow about paperwork, and there are so many sights to see. Having a sea lion colony, shark grotto, penguin rookery, and marine iguana sanctuary right by the anchorage was really fabulous. Just past the informal restaurant by the anchorage was a lagoon for snorkeling (cold water, and not many fish, but interesting to explore the sides of a grotto, and the mangrove roots.) We didn't get to the Darwin Center or the ponds to see the bird life, but we're heard they were great. All of the above could be done for free! 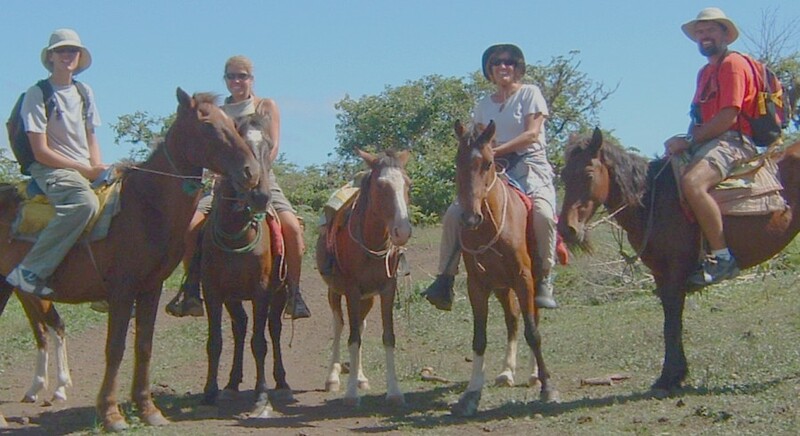 We got a bargain on our horse ride by going directly through the owner of the horses (ask around for Modesto Tupiza, or phone (05) 529-217)-- he charged $7 per person per horse, $20 for the guide, plus the $40 standard round-trip truck ride up to the trailhead and back. With a group, this came out to only $12 per person, instead of the "standard" $20 each that others pay when they go through a middle-man. (Modesto does only speak Spanish, though, so that might be a hindrance to some...) The horse riding and the volcano were a highlight in these islands where there are so many highlights!